Brett Luke | The Journal Gazette The Komets' Brady Shaw turns and cheers after a goal by teammate J.C. Campagna during the first period Saturday night at the Coliseum against Utah. 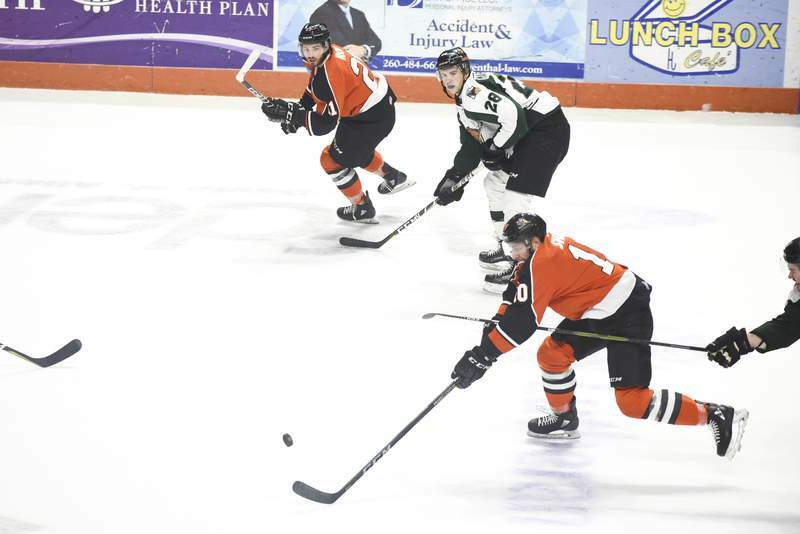 Brett Luke | The Journal Gazette Lukas Hafner and Craig Cescon of the Komets stop Utah's Jack Walker from scoring during the second period at Memorial Coliseum on Saturday night. Brady Shaw knows something about solving goaltender Joe Cannata. They were teammates last season with the Colorado Eagles, and Shaw would pepper him with shots during practices to see what was successful (rarely) against him during games, as the Eagles won the ECHL's Kelly Cup championship. 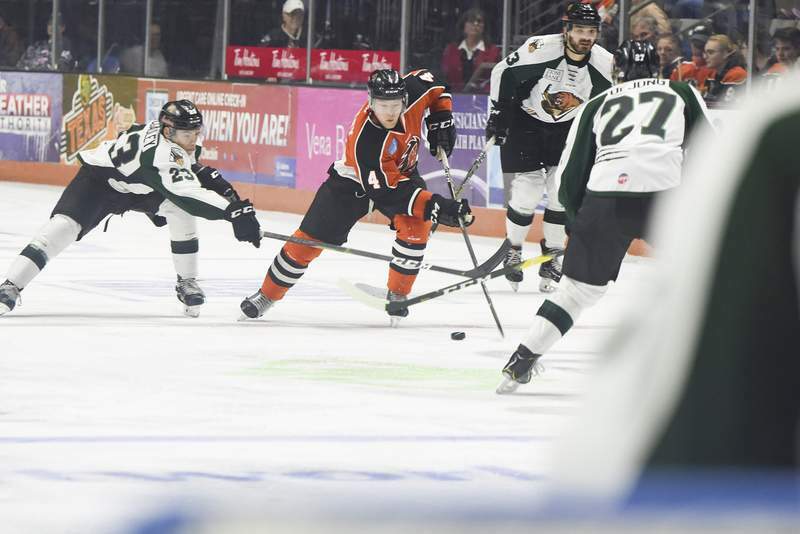 So it makes sense that Shaw got plenty of questions from teammates Saturday before the Komets faced Cannata and the Utah Grizzlies, a game Fort Wayne won 6-4 in front of 7,748 fans at Memorial Coliseum. “Joe Cannata is a great goalie and the guys were asking me earlier, before the game, 'Where do we beat this guy?' Like most good goalies, it's about getting good traffic in front of them and usually that can affect them in a negative way,” Shaw said. 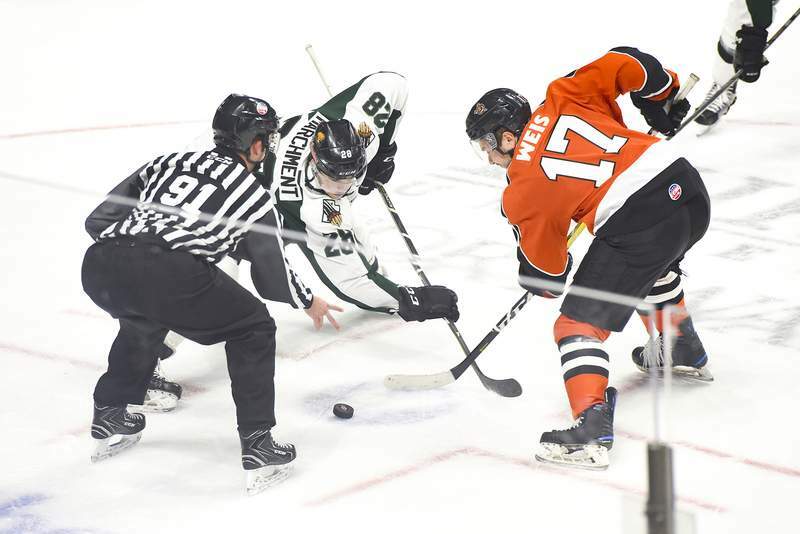 The Eagles are no longer in the ECHL – they are in the American Hockey League – but the Double-A affiliation of the NHL's Colorado Avalanche is now with the Grizzlies, who have Cannata, forward Teigan Zahn and forward Travis Barron. They ousted the Komets from the Western Conference finals last season. 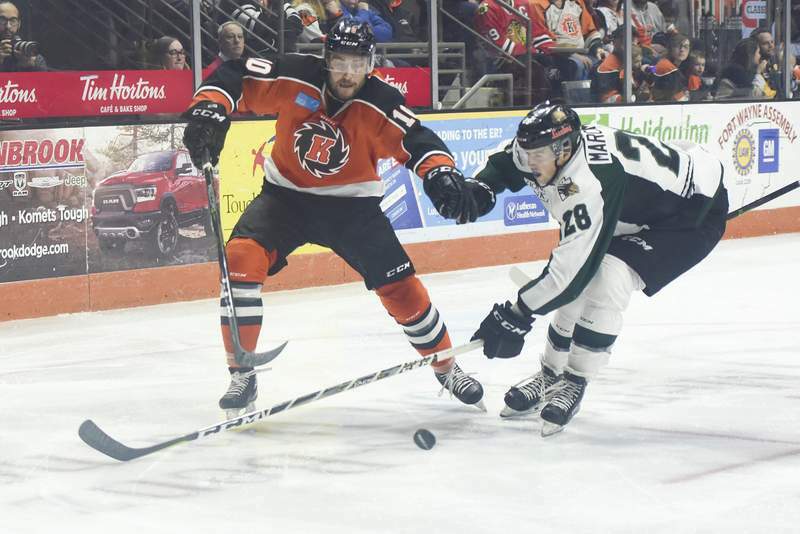 Saturday's victory may have been a small token of revenge; the Komets unleashed the first five goals despite playing without leading scorer Justin Hodgman. 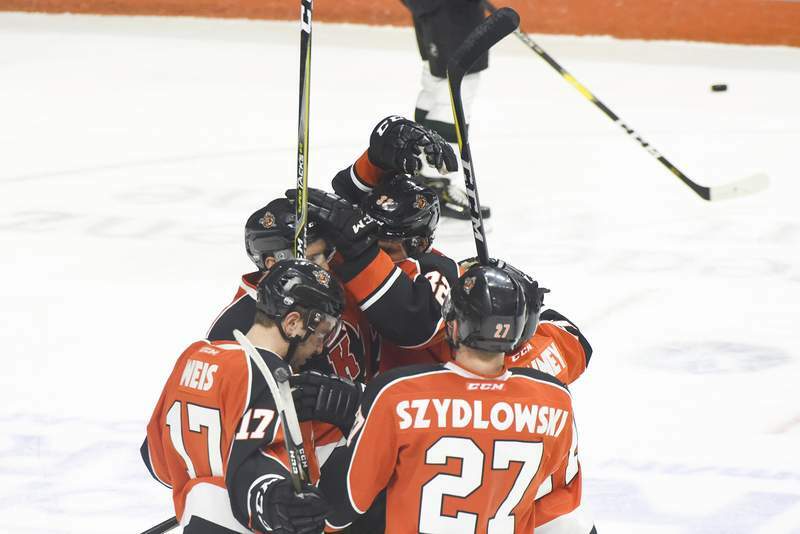 Marco Roy had a goal and three points for the Komets (21-14-1), who have won five straight. Jake Kamrass had a goal, giving him at least one point in 13 of the last 15 games. Cannata stopped 25 shots as Mountain Division-leading Utah's five-game winning streak was snapped. Lukas Hafner, Cannata's backup last season, stopped 29 shots for Fort Wayne. Shaw got the scoring going 22 seconds into the first period by sending the puck on net from the corner to set up Roy for a poke into the goal. J.C. Campagna made it 2-0 with a 40-foot shot during a 5-on-3 power play. Kamrass redirected a Ryan Lowney shot for a three-goal lead at 17:29, and Shaw finished off a give-and-go with Roy for a 4-0 lead at 18:30. Hafner preserved the four-goal lead by stopping Jack Walker on a breakaway at 11:11 of the second period. 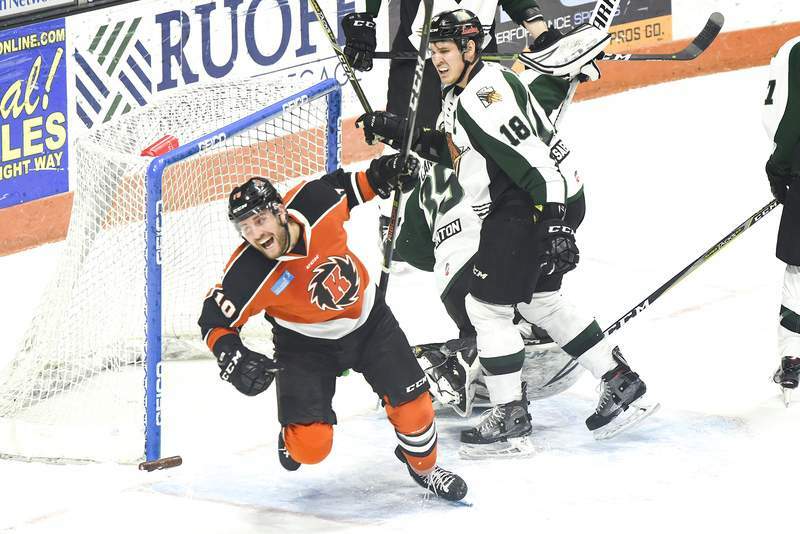 But there was a penalty called on the play – Fort Wayne's Craig Cescon slashed Walker – and that ended up benefiting the Komets, who got a short-handed goal from captain Jamie Schaafsma off the rebound of a Kevin Gibson shot for a 5-0 lead. 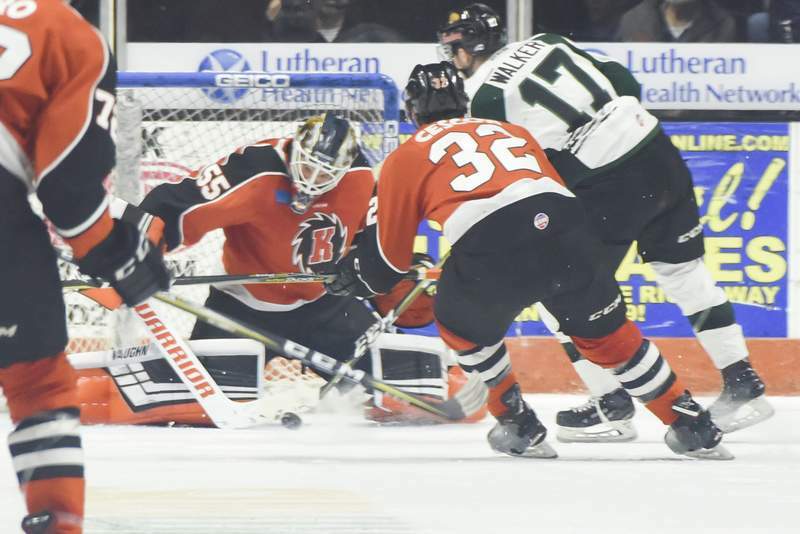 Utah (22-9-4) got goals from Taylor Richard, Tim McGauley and Ryan Walters, but an empty-net goal by Fort Wayne's Anthony Petruzzelli cemented the victory. 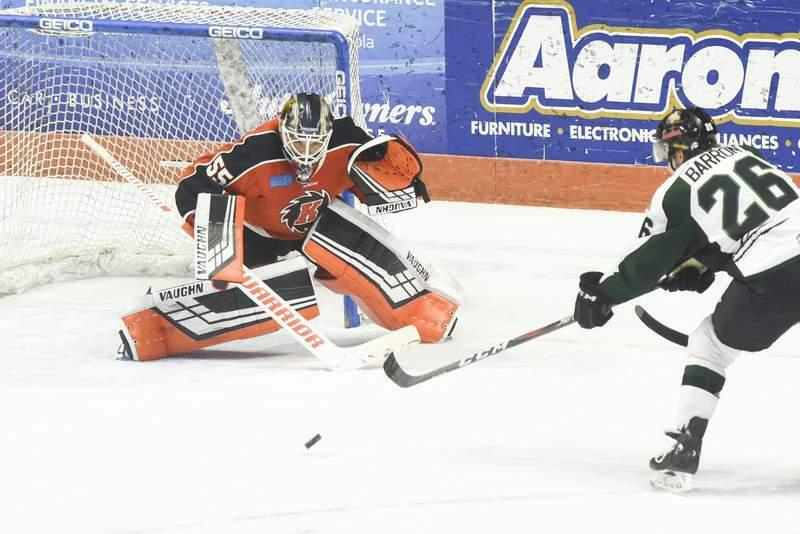 Graham cautioned his team of a letdown against Kalamazoo (15-18-2) at 5 p.m. today at the Coliseum. Notes: The ECHL suspended Taylor Crunk four games for actions Friday and being a repeat offender. Crunk punched Indy's Radovan Bondra while he was in a pile. 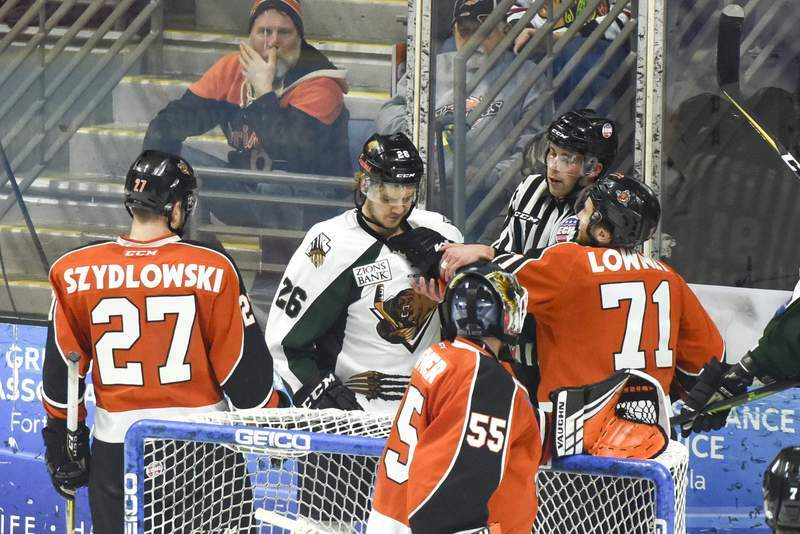 ... Hodgman was fined for a fighting major and aggressor for punching Zach Miskovic. Hodgman is day-to-day with a hand injury from the fracas.